Buffy: she saved the world. A Lot. 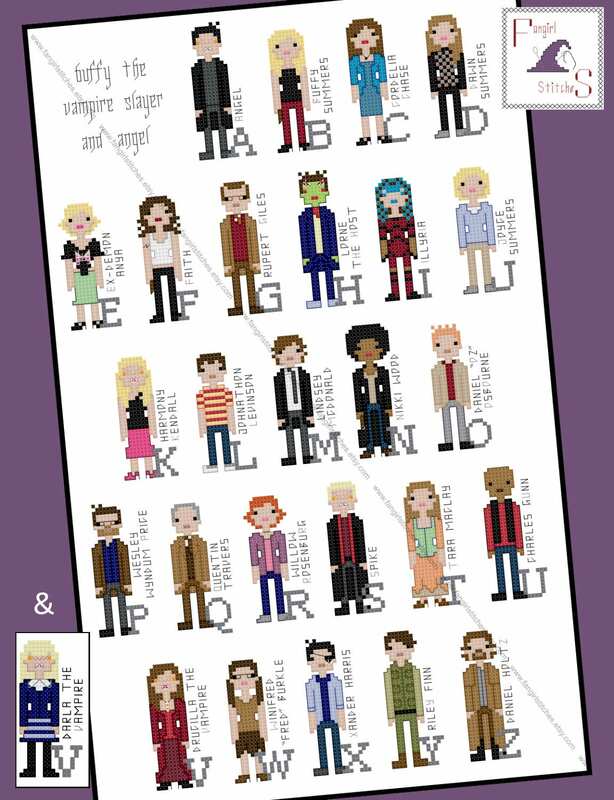 Recreate the worlds of Buffy The Vampire Slayer and Angel with this cross stitch pattern featuring 26 characters from Joss Whedon's cult-classic television shows. 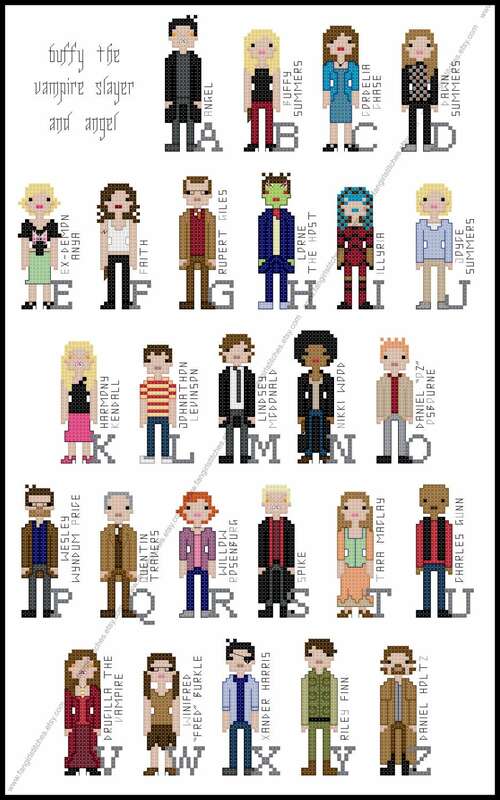 A = Angel, B = Buffy, C = Cordelia Chase, D = Dawn, E = Ex-demon Anya, F = Faith, G = Giles, H = The Host, I = Illyra, J = Joyce, K = Harmony Kendall, L = Johnathon Levinson, M = Lindsey McDonald, N = Nikki Wood, O = Oz, P = Wesley Wyndum Price, Q = Quentin Travers, R = Willow Rosenburg, S = Spike, T = Tara, U = Charles Gunn, V = Drucilla the Vampire, W = Winifred "Fred" Burkle, X = Xander Harris, Y = Riley Flynn, Z = Daniel Holtz. 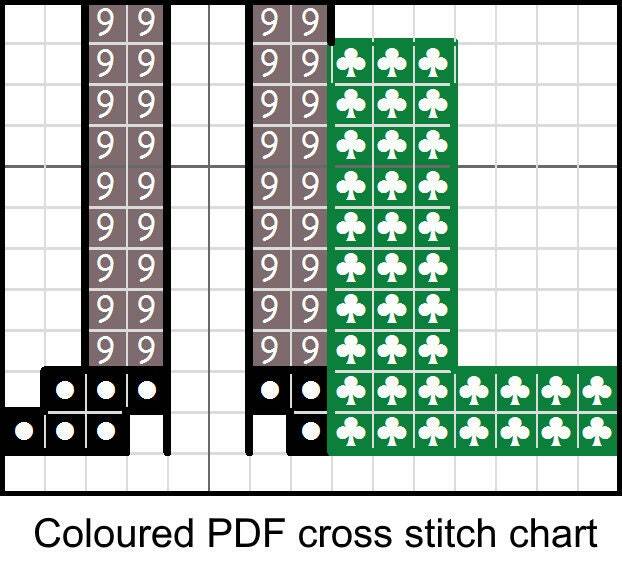 This design features whole stitch, backstitch and French knots. It’s suitable for beginners looking to stretch their skills. This is a parody (inspirational) work. 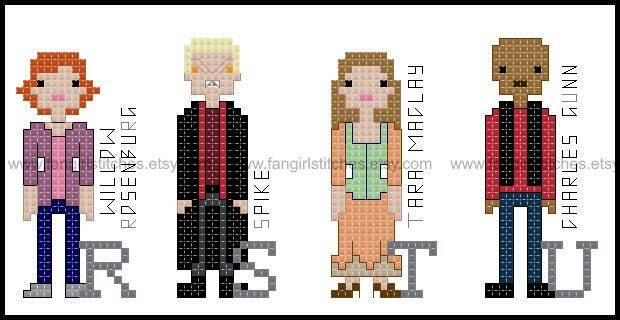 Buffy The Vampire Slayer and its characters are the property of Joss Whedon, 20th Century Fox and Mutant Enemy. This work is not sponsored, endorsed by, or affiliated with Joss Whedon, Mutant Enemy, 20th Century Fox, or any of its subsidiaries or affiliated companies and/or third party licensors. Really detailed instructions and what a fantastic design. I'm so looking forward to getting started on this! Thanks.